I always feel really ambivalent about 30/31 day nail art challenges. They are freaking tough! It requires a great deal of stamina and patience and buckets of creativity under a timeline. In short it's a marathon when I've always been a sprinter. I've never even done the traditional 31 day nail art challenge because I felt like I couldn't keep up the commitment. 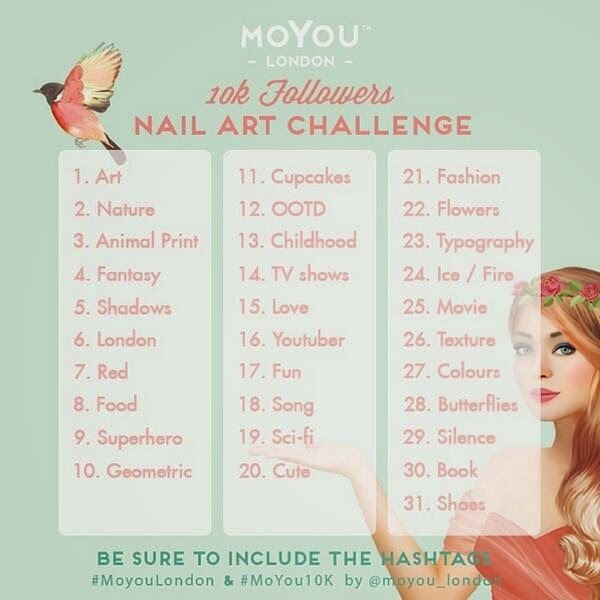 Here's the thing though MoYou London is giving away a new kit that will be releasing in June to 3 winners of this challenge to celebrate their 10,000 followers on Instagram. The contents will be 6 image plates, 3 polishes, and a stamper and scraper. I want it desperately. Desperately enough to commit to the long term run of 31 days of nail art. You can check out the various themes below but the only real requirement is that you use MoYou London plates to fit the theme. This nail art is for the 1st of May and is inspired by the birth of Venus. I didn't even realize this contest was running until very late today so I busted out this mani. I feel like if I'd had a bit more time I could have perfected it but overall I'm surprised at how well this came out considering how quickly I put this together. The detailing on this plate is exquisite and so that made my task significantly easier. I will have my nails up every day on my Instagram account +/- to the blog. Eventually everything will make it up to the blog, but in some ways creating a mani is easier than taking photos editing and then creating dialogue + details to go along with the art (which is essentially what it takes to create a blog post). Everyday will likely destroy me in terms of wanting to do that every day, but when I finish I will at least create a page for my amalgamated art. Wish me luck darlings! Thanks for reading and see you next post! I know right! I'm going to try, but honestly I think this will be good for me and I can finally start using up some of the MoYou plates I've been hoarding lolol! You go girl! A mani a day for 31 days is one hell of a challenge! I'm just glad it isn't a requirement to do them all to be entered to win. Lol I'm going to want to shoot myself in the head, but I figured it was a good time to do the 31 day nail art challenge especially if the result means the chance to win some cool plates! Thank you sweetie! Why don't you go ahead and join? It's free and easy and honestly if you want to enter that shouldn't be what stops you. As long as you have a phone the rest is easy peasy!